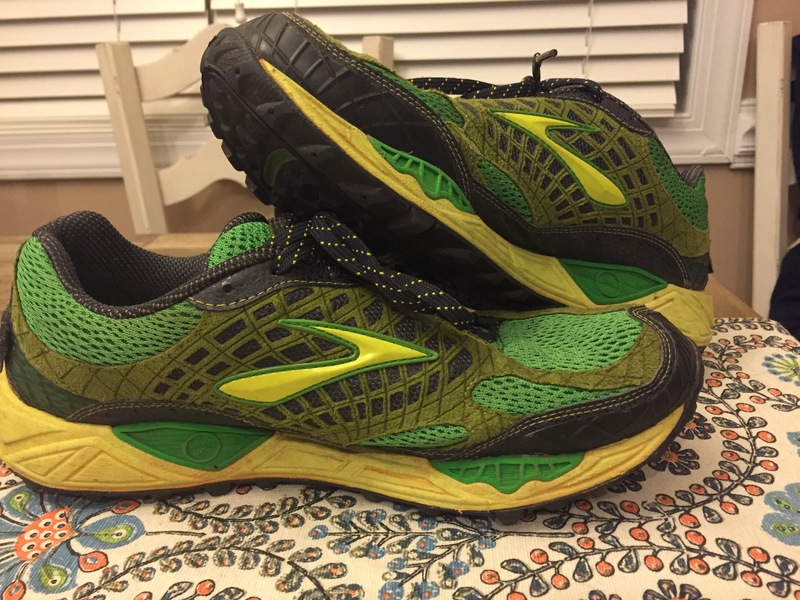 When I first started running trails, and given that I was a Brooks man through and through, I did what any Brooks man would do and order a pair of Cascadia (version 7). 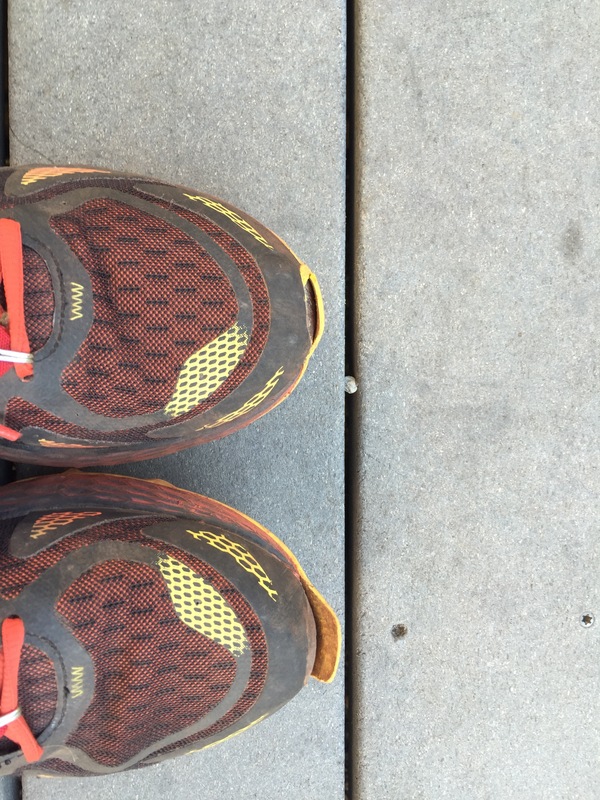 This was a great beginner trail shoe. It was sturdy, tough, had a nice fit, and drained well for creek crossings (which I, in my newbie trail ignorance, assumed you changed socks every time you crossed a stream. Ha, yes, I know, laugh on…). That shoe got me through my first trail race and then my first two 50Ks. It was a workhorse and I still wear it for lawn work when I need something with a solid grip and durability. A year or so later, in search of something a little lighter but with similar durability, I wore the Salomon Sense Mantra II (two pairs worth). That shoe got me through all my trail races for about a year, up through last October. At that point, I did the Birmingham Stage Race and wore the same pair of shoes for all three days, 53 miles. I really needed to have a second shoe with a little more cushion for these multi day races. My feet were pretty worn out by the end of that three days. It was in that time that New Balance had introduced their “Fresh Foam” technology and the NB 980 Trail with Fresh Foam. Looking for some cushion, but not too much, I gave the 980TR a try. 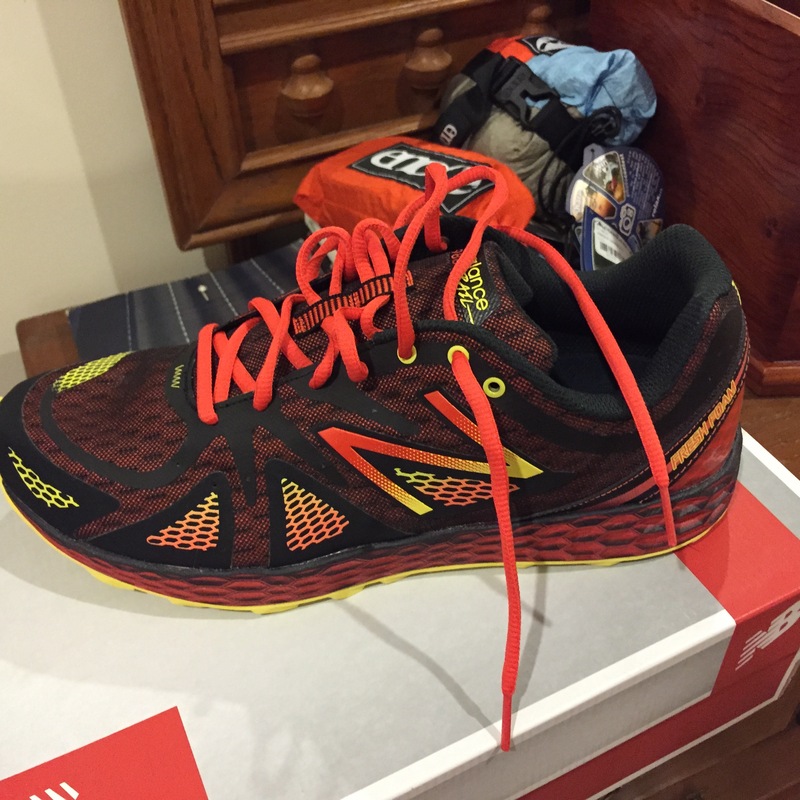 I wore it at Crusher Ridge 42K that October (2014) and really liked the shoe. Reviews suggested wearing this half to a full size up. I ordered it .5 size up than my normal (to be honest, I could really go a full size up on this shoe–more on that later in the fit section). A lot of the longer races here have a few miles on jeep roads, fire roads, and even some paved sections that connect one trail to the other. The NB feels nice on harder surfaces. 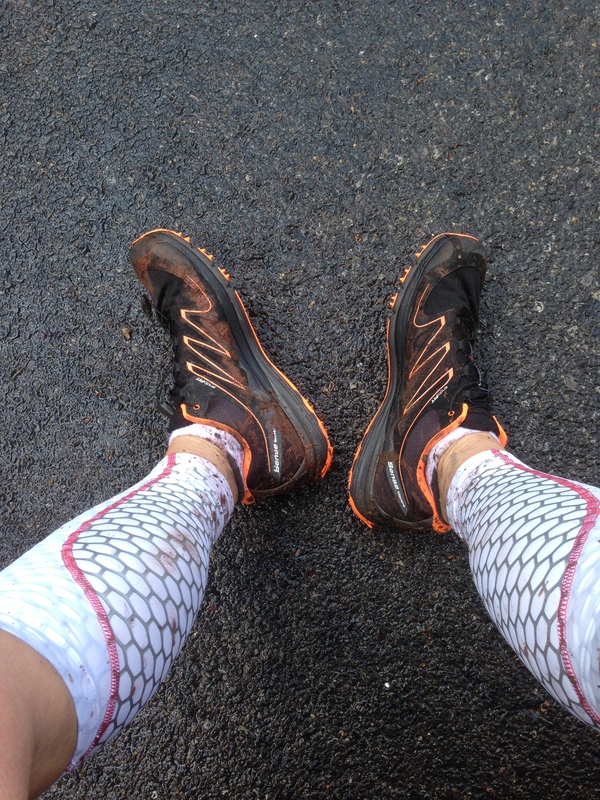 The Brooks and the Salomon never had enough cushion for road or harder trail miles. I love the color ways on these shoes. Saucony, Mizuno, and New Balance have really led the way when it comes to introducing new colors and color schemes to shoes. And it also seems that we are in an age of bright colors after a few years of blues and grays and blacks. This shoe has color, but you also don’t feel like they will burn the retinae of your fellow runners. My second pair (just purchased on sale) is the blue/yellow. I like them both, but the red is my favorite. The first thing I notice when I put on these shoes for the first time is that they feel like I’ve ordered them too small. Always. 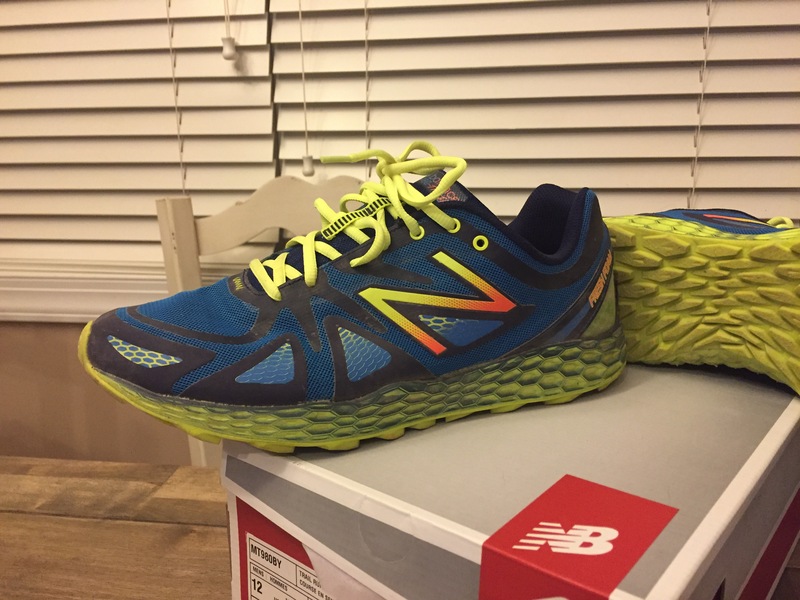 The toe is slightly more pointed than a lot of trail shoes (this is a trait common to a lot of New balance shoes, they just love that rounded/pointed toe. Thats why I went a half size up. 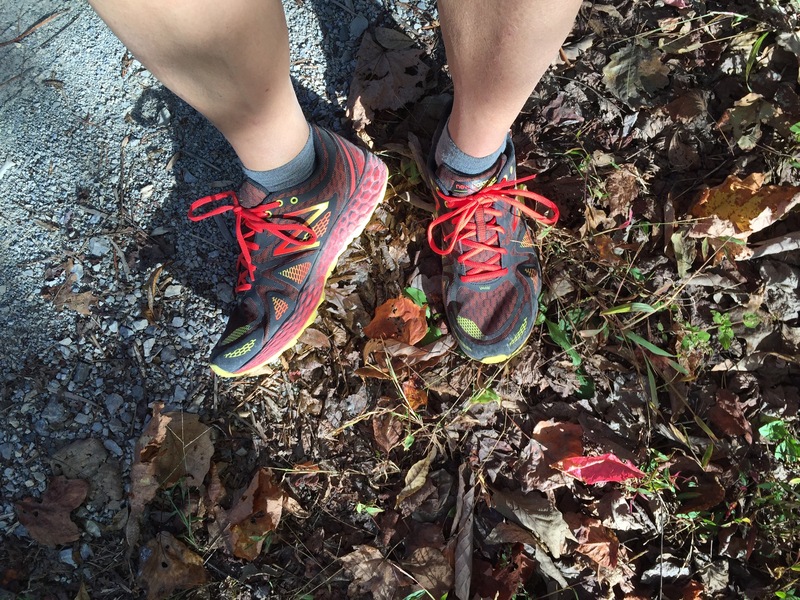 But once they’re laced, even with thicker trail socks, they feel fine and I have no issues. The only thing I wonder about is how they’ll feel late in a long race (50 or 100 miles). Will I need a roomier more cushy shoe for that distance with swollen feet? Will moving to a full size above my normal shoe size do the trick? I’ll find out soon enough since 100-miler training has begun. 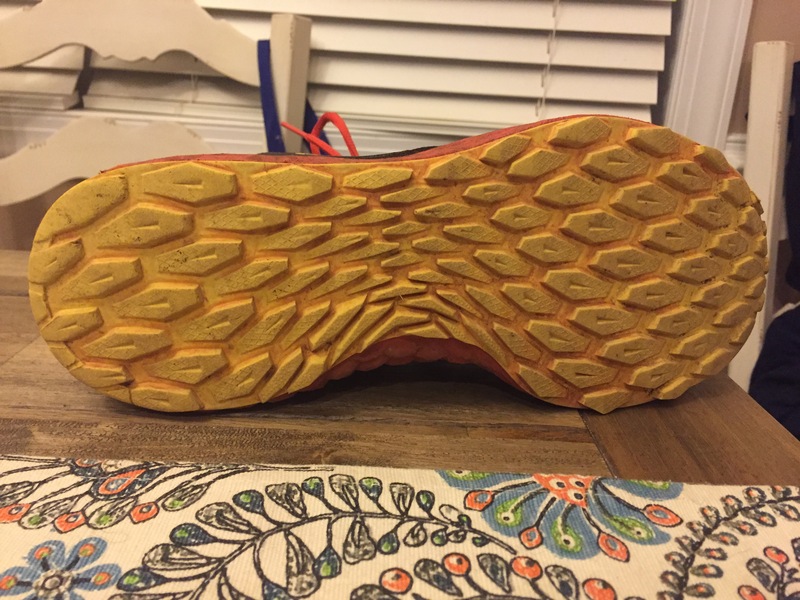 One year after my first run and the sole has proved pretty durable, but then again, when you run on dirt and rock you don’t get a great deal of wear. I have yet to run in a really wet and muddy trail race. I’ve been on trails after rain but not where the trail isa mess of water and loose thick mud. I’ve heard chatter about the 980TR not having enough of a sole to “grip” the sloppy conditions. I’ve yet to personally experience issues like that. The only knock on these shoes is the grip in muddy conditions. What I have experienced is the rubber toe cap at the end of the shoe has a tendency to peel away from the upper. This happened on two pairs after only 50 miles or so. Not sure if this is just an isolated adhesive issue or if others have experienced this. The problem is that when that part peels away it has a tendency to catch small bits of trail, or vine, or trail stuff in the shoe and trip the runner. l’ll really like this shoe as a middle ground between the more max cushioned shoes like Altra or Hoka and shoes that are less so. I still like my Salomon Sense Mantra II, but I find myself in the New Balance more and more. Is this the shoe that gets me to the finish of my 100 in march? I don’t know yet. 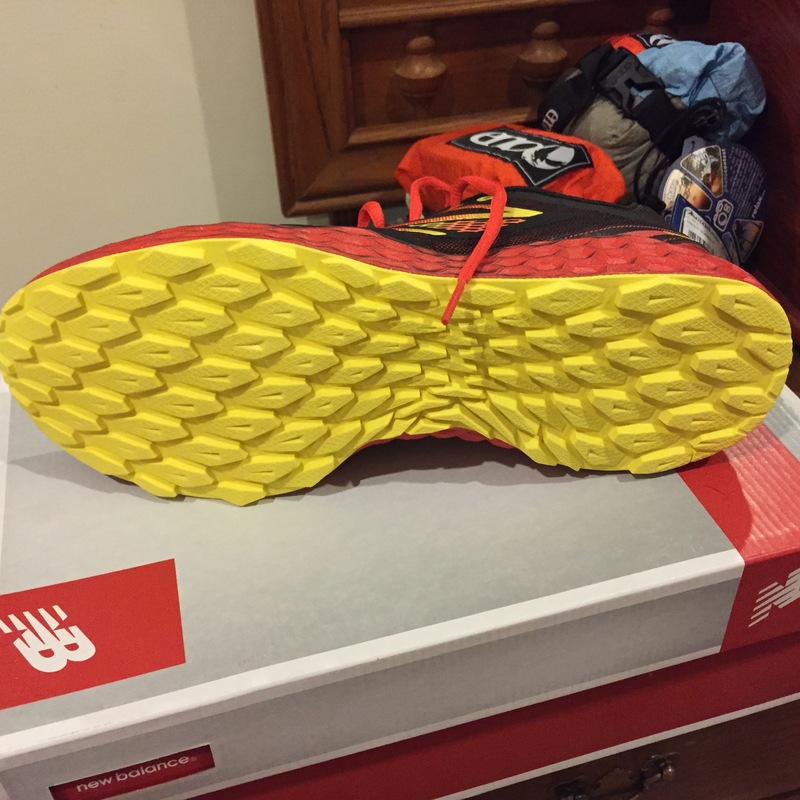 Do I need a more max cushion shoe for the later miles in that race? We will see. Until then, this is the shoe I’ll train in. I still want to try the updated version, called the Hierro. I purchased both pair of the NB 980 TR myself. No one at New Balance would answer my emails inquiring about the possibility of review samples.